Midnyte Reader: Psychos: Serial Killers, Depraved Madmen, and the Criminally Insane. Psychos: Serial Killers, Depraved Madmen, and the Criminally Insane. 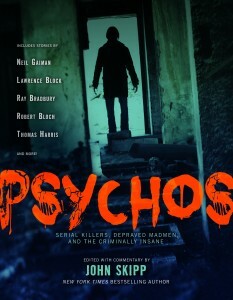 Title/Author: Psychos: Serial Killers, Depraved Madmen and the Criminally Insane. Edited by John Skipp. Publisher: Black Dog & Leventhal. All in all: Fantastic & Frightening! Synopsis: This collection of thirty-five terrifying tales of serial killers at large, written by the great masters of the genre, plumbs the horrifying depths of a deranged mind and the forces of evil that compel a human being to murder, gruesomely and methodically, over and over again. Psychos is the first book to collect in a single volume the scariest and most well-crafted fictional works about these deranged killers. Some of the stories are classics, the best that the genre has to offer, by renowned writers such as Neil Gaiman, Jack Ketchum, Edgar Allan Poe, Robert Bloch, and Thomas Harris. Other selections are from the latest and most promising crop of new authors. Favorite Quotes: "Right or wrong, the loser of any argument is the one who broods on it after the last word." ~Life Coach. "...standing inside the stained-glass confection of the old church was like being imprisoned inside a kaleidoscope of jewels." ~Neil Gaiman, Feminine Endings. 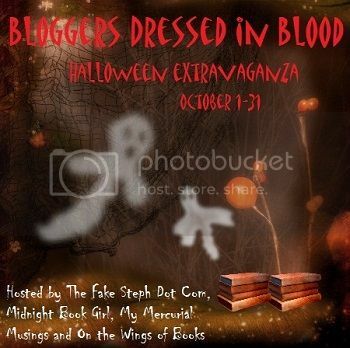 My thoughts: This is quite a collection of horror, and the scariest part? It could all conceivably happen. There are no vampires, werewolves, ghosts or witches. There are only people. Horrible, twisted people. From lunatics you meet on the road, to intruders who invade your house not necessarily to harm you, but to victimize you all the same. As John Skipp states, "We are obsessed with our crimes." I think this shows in our television programming, cinema and the plethora of thrillers on bookstore and library shelves. Crimes, or rather why people commit crimes fascinate people. I know they fascinate me. By reading these stories, you may not get all your answers and they may in fact, bring up more questions, but still fascinate. There are quite a few familiar re-printed stories along with a few new ones. Some had a familiar ring, as if I'd read them for a class, but I can't quite remember. Some of my favorites are Joe Lansdale's Incident On and Off a Mountain Road in which the protagonist had more than a few surprises up her sleeve. I think my favorite was The Shallow End of the Pool by Adam-Troy Castro, because it did give some insight into the main protagonist. In the story she gained insight and learned and I felt empathy for her, although I don't think I could ever have gone through what she did. Life with Father by Bentley Little is a sad story of recycling gone over the edge and don't make the same mistake I did by eating lunch while reading that one. Life Coach by Cody Goodfellow impressed me with it's prolific writing and astute observations. In Mannerly Man, a kind of Dystopian Horror, it seemed to me that the "killer" was simply a victim of circumstance, behaving in a way a new society taught and condoned. Intruder put me in mind of a lunatic with OCD and as disgusting as it was, it still made me laugh. What I also love are insights. Phrases of philosophy that are gems. "Paradise can be nothing more than a Hell not quite as bad as a Hell you've already known." from The Shallow End of the Pool. and another favorite from Now Hold Still by David J. Schow with the comparison of good memories versus bad ones. "Good ones tend to shrink on the shelf, while bad ones swell up to absorb more space." How sad, yet true in a lot of cases. Perhaps if people could transpose the two, stop dwelling on the bad ones and focusing on the good ones, the world may be a better place. I appreciated was Skipp's intro to each story, the reasons he included them in his anthology. However, they read more like he was discussing them with me. Sort of like when a friend gives you a book or story with the reasons you should read it. The only issues I had were a few typos that made sentences grammatically awkward and pulled me out of the story when I tried to puzzle out a meaning. However, it did not make the stories less enjoyable or less horrific. Of course, there are always a few stories that grab you more than others with Sensible Violence being one in the collection that I didn't connect with as it just read too long for me and took place too much in the protagonist's mind. However, don't skip any of the stories, they make a complete package, kind of like a music cd. Experience the entire project and be repelled, fascinated, and be thankful that you have never run into any of these characters. Also check out Darkeva's review of Psychos HERE. I am not easy to scare but serial killers do. I also used to be obsessed with Helter Skelter and the whole Charles Manson thing when I was a kid. Hannibel Lecter never scared me though. The guy that was kidnapping and skinning the girls did! It's the things that I think that could really happen that scare me the most. Psychos sounds absolutely terrifying! The synopsis alone creeped me out. I could see myself losing sleep over this one! This is the kind of horror that tends to get me a bit, because, as you said, it could conceivably happen. I quite enjoyed Bloch's Psycho and am hoping to read American Psycho when I have time. This book looks like one I'd really enjoy. Thanks for the review!